It is 1930 and two teenagers graduate from a Minneapolis high school. One of them, Eric Sevareid has no plans for the summer and a classmate; Walter Port talks him into joining him on a canoe trip he had been thinking about for some time. 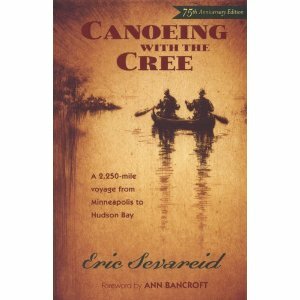 It would be canoeing from Minneapolis up the Minnesota River and Red River into Canada and to the Hudson Bay. Walter knew enough about the plan to know there would be rivers and lakes all the way to Hudson Bay. They didn’t know a lot more about what such a journey would involve nor did they have the money or experience for such a trip. However, as teen age boys, these details didn’t deter them. They made a list of items they thought they would need, somewhat pared down to fit their budget. The obtained a used eighteen foot square sterned canvas covered canoe for the trip. Eric, who had been the editor of the school paper, suggested they get a sponsor, maybe a paper that would print stories they would submit while they made the journey. They were turned down by some prospects but did find the Minneapolis Star interested and they were given a stipend to help them get started and with another payment if they finished the trip. And so they took off from Minneapolis on June seventeenth with worried parents waving and hoping they would return in a few days after facing the reality of what they were attempting to do. The trip up the Minnesota and Red River into Canada and Winnipeg had been mostly tedious and time consuming. They did find people along the route had been following them because of the stories being run in the Minneapolis Star. At times this became helpful when they ran into difficulties and also provided a chance to meet people who provided helpful information and also some free meals along the way. However, by the time they reached Winnipeg they were worried because they were running behind their planned schedule and the possibility of not making it to Hudson Bay before the fall freeze up. In addition the most hazardous part of the trip lay ahead. On Lake Winnipeg they experienced ocean sized waves and winds that kept them off the lake for days making the completion of the journey before freeze up even less likely. After leaving Lake Winnipeg they faced five hundred miles of wilderness and little chance of getting help if they ran into trouble. If the streams froze up they would have little chance of surviving with only the summer clothing they wore. Their maps were rudimentary and the possibility of becoming lost was added to their concerns. There was no GPS, no means of communicating with the outside world. They learned many of the things they needed to know by doing; such as how to maneuver the canoe through rapids that could have torn it apart. Great story, well written by Eric Sevareid.